Lester Feder breaks the news at Buzzfeed that Larry Jacobs, managing director of the World Congress Of Families, and Don Feder, communications director for the consortium of groups, are still linked to what was originally 2014’s World Congress Of Families summit in Moscow. The WCF had officially “suspended” plans for the summit in March, citing Russia’s invasion of Crimea. This came amid growing disillusionment among the American religious right over their close ties with an increasingly dangerous Russian regime. Before WCF’s decision, Penny Nance, president and CEO of Concerned Women For America, had pulled out of the conference entirely. The Moscow event has been rebranded the International Family Forum, and will not receive funding from the WCF’s head office. But two members of the World Congress of Families leadership — managing director Larry Jacobs and communications director Don Feder — are listed among the event’s organizers in a program for the event posted on the website of the Russian Istoki Endowment Fund. In an emailed response to questions about WCF’s role in the Moscow meeting, Jacobs, the managing director, wrote: “It’s NOT a World Congress of Families event and any one who calls it that is wrong, mis-informed or lying.” He also said the event had received no funding from the WCF’s Illinois headquarters, and that the group’s president, Allan Carlson, had declined an invitation to speak there. Jacobs referred BuzzFeed to the description of the event posted on the Istoki Endowment Fund’s website, which lists him as an organizer. He did not respond to several inquiries on whether he would be going to Moscow. 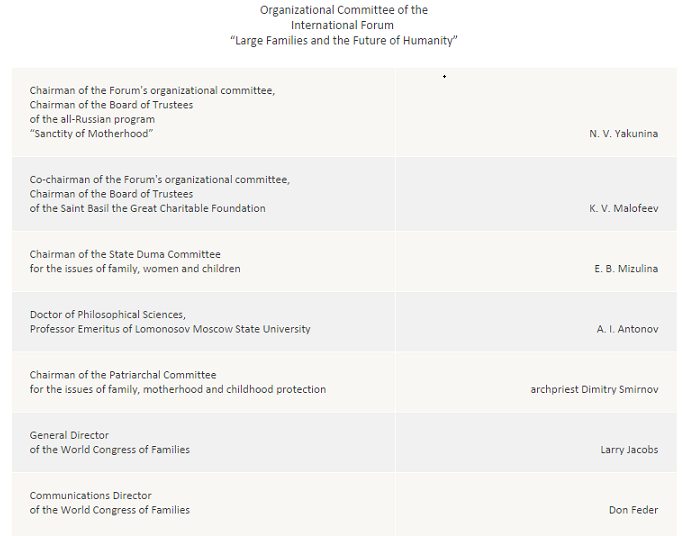 That screenshot, pictured above, is from the Istoki Endowment Fund’s website, so for him to say it’s NOT a World Congress of Families event and then direct us to the Istoki website answers no questions. Larry Jacobs and Don Feder are clearly listed as organizers, and their organization’s name is on that page. Moreover, Jacobs won’t say whether or not he’s going to Moscow. If he is going to Moscow, then the WCF’s “suspension” of plans was a sham, meant to remove the group’s activities from the spotlight of public scrutiny. Moreover, if he’s going to Moscow, it really doesn’t matter whether WCF directly funded the event. As TWOCARE has reported in the past, the American religious right is anything but amateur-ish when it comes to funneling money in shady and ethically questionable ways in order to achieve its ends. Well, gentlemen, which is it? We shall soon find out, though my instinct is that Austin Ruse may have accidentally told a truth he wasn’t supposed to reveal. Regardless, it should be understood that the World Congress Of Families hasn’t changed a bit. Their suspension of the Moscow conference wasn’t because they suddenly understood how unsavory the characters they were joining up with actually are. It was PR, plain and simple. Any American who is paying attention can see that Putin’s regime is a major threat to the civilized world. And that regime shares a lot of the same goals as the American religious right.